But, really, this is a "what worked for me" for anyone who might be interested in trying this out! I spent the week crafting ALL THE THINGS. I can't figure out if it's the almost-fall time of year or stress that makes me want to make things but I guess I'll just enjoy the productivity! This week I worked on a picture frame my friend Cathy gave me. Autumn was able to help me do most of it which made it even more fun! Here is what it originally looked like. These pictures are, by the way, an odd mixture of camera photos and phone photos! Also, Autumn thought the picture was "beautiful." I told her we can put it somewhere in her room if she likes. :) I took the picture and the glass out of the frame and took it outside to spray primer I had from another project on it. 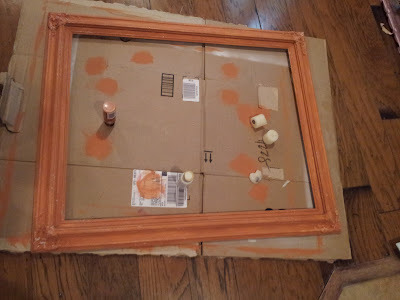 Then, Autumn and I painted it with Anita's Terra Cotta Acrylic Paint from Hobby Lobby. 67 cents for the win, guys. After the paint dried, we rubbed wax from a used candle onto the spots I knew I wanted to distress. After priming, painting the base coat, and waxing, we painted what I thought was going to be the final coat. It wasn't. I liked the color of the paint I used but next time I will use something a little thicker or higher quality or something. It took 3 coats of the DecoArt Light Buttermilk paint to cover the orange but for a 99 cent bottle, I can't complain too much. It looked fine but with the white, it was really hard to see the pretty decorations carved in the frame so I took to the internet again. I decided to use some ebony wood stain I had in the paint closet to antique the frame. I let Autumn paint the stain onto the decorations and the frame edges and I wiped it off immediately. I was afraid it was too dark but it really looks great. The carving stands out nicely. In the above picture, you can see all my supplies. 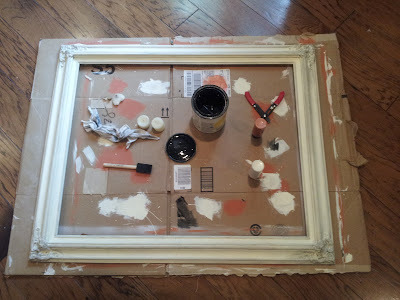 Foam brushes (to make it easier for Autumn to paint), wax, wood stain, wire cutters for opening the can and smushing down the staples that held the glass in, and rags for wiping the stain. Here's an up close of the frame's corner post-staining. The last thing I did to the frame was sand! Autumn helped me with this, too. We took heavy sand paper to the edges and raised bits. The spots where the wax covered the base coat came off perfectly. I even got a few spots down to the gold so we can see it glint a bit in the light at spots. It's hard to see the distressing in photos so here's another corner shot. I seriously love how the orange comes through. We ran over the whole thing with fine sandpaper and the wiped it down. Next was the glass. We sprayed primer (I love spray primer) on the glass and let it dry. I have tried sanding glass before when making a chalkboard but that is a pain and painting the chalkboard black was way harder on sanded glass than spray primed glass. When I planned the chalkboard, I thought making it magnetic would be super fun. Well, let me just tell you not to bother. If you want a magnetic chalkboard, buy a different paint or use a metal sheet because the Krylon Magnetic Paint is useless. Which I would have known if I had specifically researched it before buying it. I used 4 coats of paint and let it cure and it still doesn't work. So I think I am going to return it. It even globbed some spots on my nice glass. Rar! Last thing! We painted the chalkboard paint on! This part went great! We did the first coat horizontally and the second coat vertically. It looks fantastic! I am so stinking happy with this frame. It is such an update from the original look and I feel like it's something I'd find at Pottery Barn. Oh! One thing...when you make a chalkboard, don't forget to prime it! But don't do what we did...we primed it after we framed it which made a huge mess in all the crevices. But we had fun doing it together. And making crazy faces. Here it is on the mantel! This is another spot I'm considering. I don't love that picture of me and Mike being there but it fit and everyone else likes it. But the chalkboard would look good there, too, and might not blend in with the fireplace as much. Thoughts? Autumn joined me in the picture taking, too! AND she got the honor of doing the inaugural drawing! I thought about adding a quote about fairies because the picture is of Penny, Autumn, me, Molly, and Nanny and Boppa as fairies (I don't know why Mike got left out--she might have gotten distracted! ), but I decided it was great as-is! I LOVE the frame!! This must've been the weekend for painting projects. I painted some furniture that has been in my family since the 1950's and put new nobs on it. It looks pretty good if I say say myself! ha!! Also, I have lost your email address. Would you mind sending it to me again. Thanks!